Brazil is so much more than the rhythms of Carnival and the beauty of Rio de Janeiro. This vast country boasts an enormous variety of landscapes, from the lush tropical mountains along the coast to the dunes and deserts of the north and, of course, the world's largest tropical rainforest. Thanks to the diverse natural beauty of Brazil, many options await the adventure traveler. Due to Brazil's size, it's not always easy to get from one place to another. For those planning to visit more than one destination, flights on the nation's budget airlines will probably be the best option, although a comprehensive and efficient bus system exists in Brazil. Iguaçu Falls, or "Foz do Iguaçu" in Portuguese, are waterfalls that lie between the Argentine province of Misiones and the Brazilian state of Paraná. A UNESCO World Heritage Site, the falls are not only a beautiful sight to see but also offer plenty of activities for adventure-loving travelers. You can meet native tropical birds at the Iguassu Falls Bird Park, tour the nearby dam, take boat rides past the falls, hike in the national park, and take a helicopter tour to see the enormous falls by air. The park is easily reached by bus or taxi from the nearby Foz do Iguaçu Airport. Flights and long-haul buses travel from Rio de Janeiro to Iguaçu Falls. 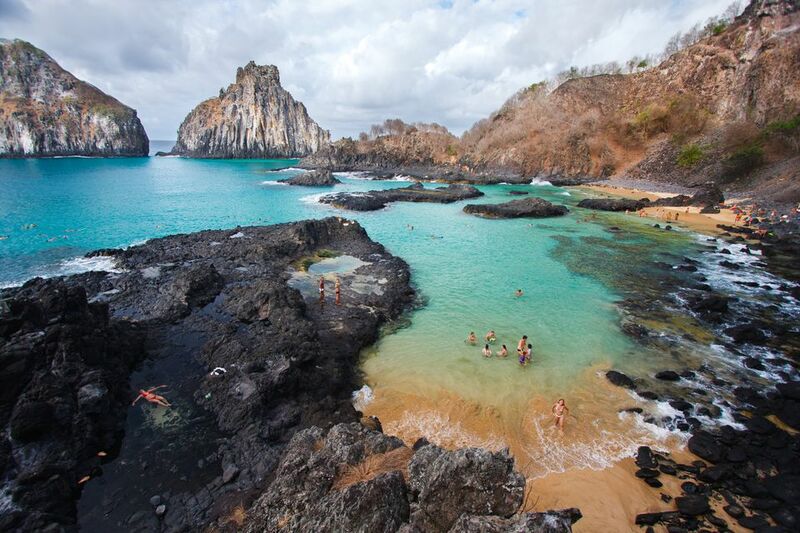 Located more than 200 miles off the coast of the northeast of Brazil, the archipelago of Fernando de Noronha consists of twenty-one stunning islands and islets. This fragile ecosystem, a UNESCO World Heritage Site, offers an array of experiences for travelers, but the number of visitors is limited to protect the archipelago's delicate nature. The islands are known for the wildlife, especially sea life, including dolphins, whales, sharks, and sea turtles that swim in the clear, warm water. In fact, the area is protected as a national marine park. Adventure lovers will appreciate the views of the islands and sea from the many hikes as well as the swimming, surfing, and diving possibilities here. It is possible to fly to Fernando de Noronha from the cities Recife and Natal. This national park is located in the state of Maranhão in northeastern Brazil. The famous landscape happens when rainwater pools between deposits of sand along the coast, resulting in thousands of clear blue lagoons. The best time to visit this natural wonder is between July and September when the lagoons are at their peak and the weather is typically not too hot. Lençóis Maranhenses National Park can be reached by flying into São Luís, the capital of Maranhão, and then taking a Jeep into the park. Once inside the park, a guide can take you to explore the dunes and lagoons (going with a guide is highly recommended since it's easy to get lost among the endless dunes). Be ready to swim in the lagoons, slide down the dunes, and explore the park by hiking with a guide. Costa Verde, or the "Green Coast," is the stunning coastline that runs between Rio de Janeiro and Sao Paulo. The views here are made even more dramatic by the serra--mountains covered in tropical vegetation--that overlook the beaches. Hundreds of beaches, some accessible only after walking more than an hour, offer visitors more than just beautiful places to relax. In this area, you can hike up hills for spectacular sea views, explore islands by boat, experience the area's turquoise water by snorkeling or kayaking, and take in a piece of paradise on Ilha Grande, the areas' largest island where the only motorized vehicles you'll notice are boats. Costa Verde is easily reached from Rio de Janeiro by car. Plan at least a couple of days to explore one of Brazil's most beautiful regions. Along with the Costa Verde, there are other places to visit near Rio de Janeiro if your travel itinerary does not allow for long-distance travel in Brazil.